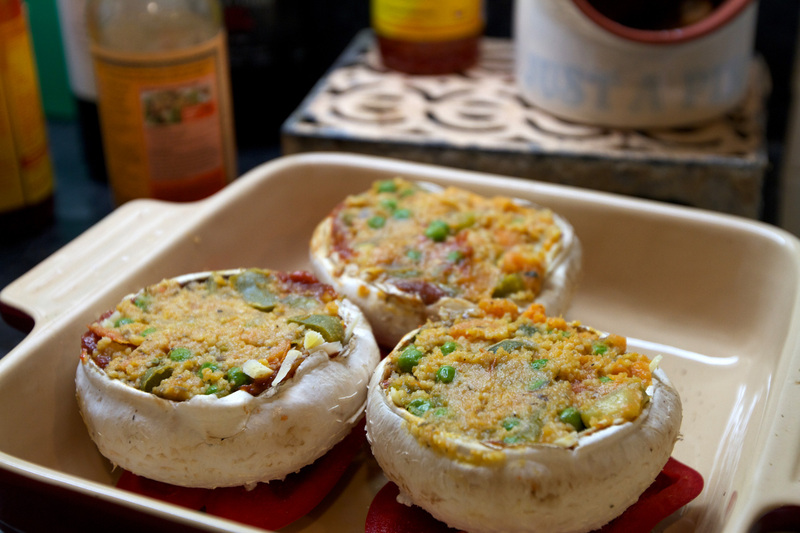 Hi there, so these stuffed mushrooms are very different from my last ones. Recipe Here. So this isn’t really a development of that recipe but more of a sequel. So we have a few different parts for this recipe. And yes it is a vegetarian recipe. If you like eating meat then cook a nice chunk of rare fillet steak with it. Firstly we are going to cook a simple tomato sauce. Get a small sauce pan on the heat. 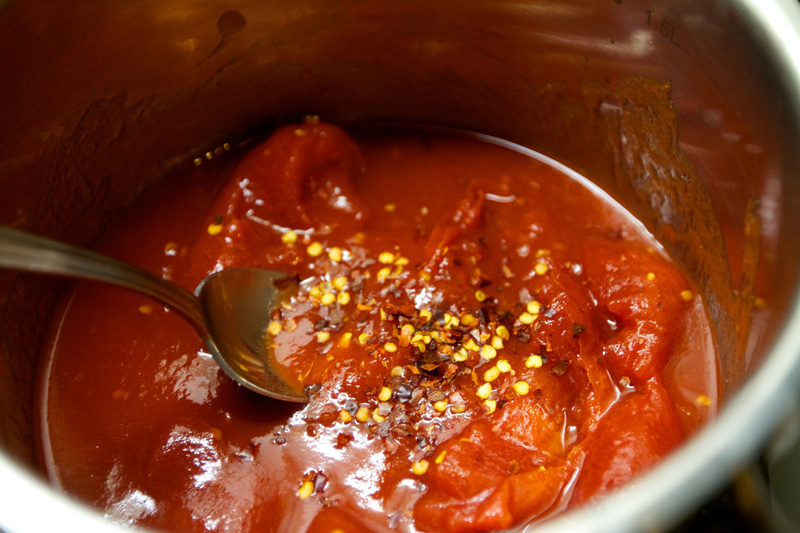 Add 1 tin of whole tomatoes, a pinch of salt, pepper, dried chilli flakes and a teaspoon of brown sugar. Add a splash of Worcestershire sauce too. Tip. Don’t buy the chopped tomatoes in the tin buy whole tomatoes in the tin. You get all the good stuff inside the whole tomatoes. It’s packed with flavour much more than the already chopped ones. And if you think about it, it’s one less process for the tomato to go through so it makes sense. You get nicer little random chunks when you mush them up too. Now for the vege mixture. You can use almost anything you like really.The main bit is the sweet potato. Right. So we have the tomato sauce simmering away gently getting nice and thick and tasty. 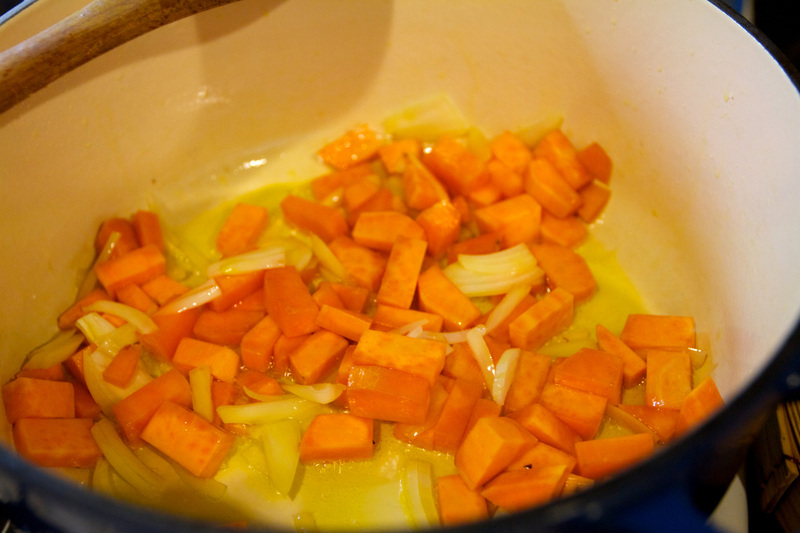 In a large deep sauce pan on a medium heat add the olive oil, the onion and sweet potato. Cook this off for a few mins so it starts to brown off and soften. Add a pinch of salt and pepper. Now add the green pepper and cook for a few more mins. 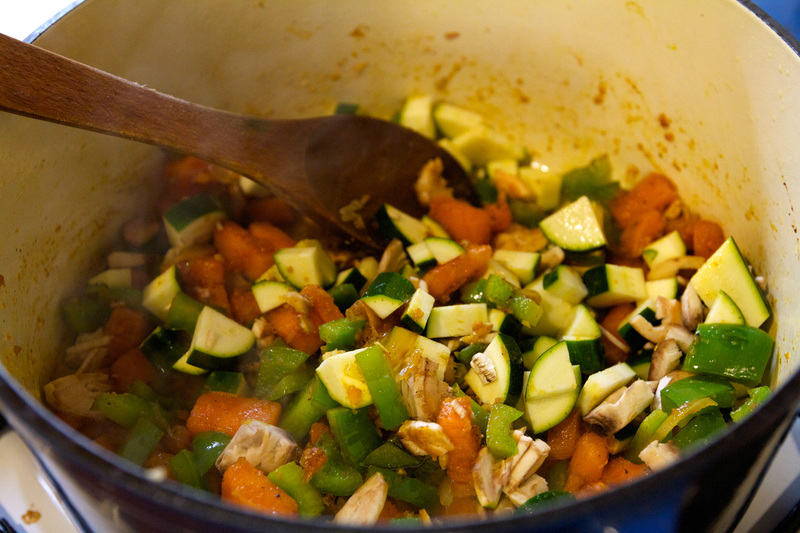 Now add the courgette, the mushrooms and the garlic. Give this a good stir and cook for a few more mins. You start to see the sweet potato start to break up a bit . Some of the bits will go a bit mushy and start to stick on the bottom of the pan and go a bit brown. This is good. Make sure the heat is medium to low. We don’t want it to burn but to just to get a lightly golden colour on the base of the pan. Now one it’s doing this add about 200ml of stock. 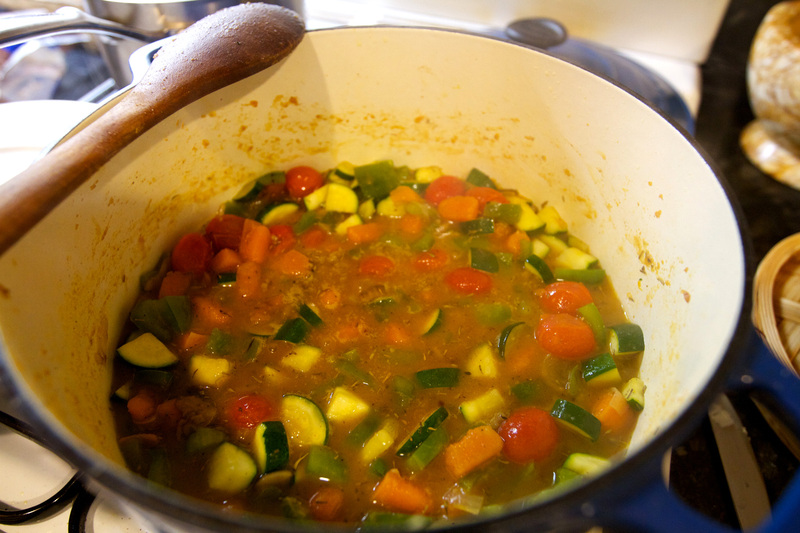 Vegetable stock is fine. Give this a good stir, bring to the boil then turn right down to a simmer. At this point we will add a handful of Quinoa. 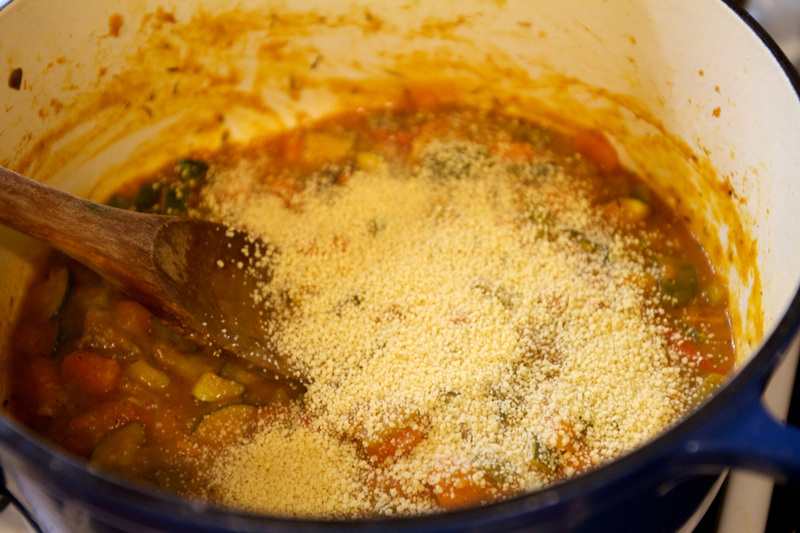 If you are using couscous instead we will add it later. Let this cook off and thicken for about 5-6 mins. Halfway through this time add the peas. 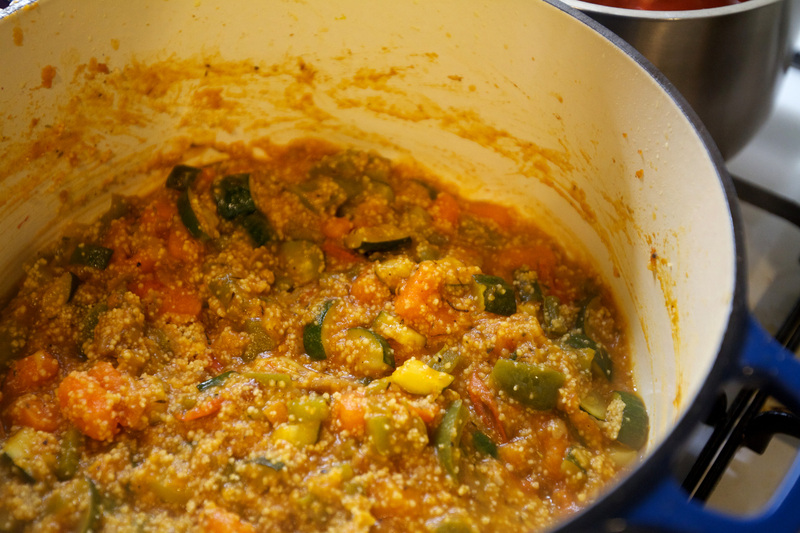 Right, at this point if you’re using couscous instead of Quinoa add the couscous now and stir well. Turn off the heat and pop the lid on and leave for 3 mins. So this is the main mixture. 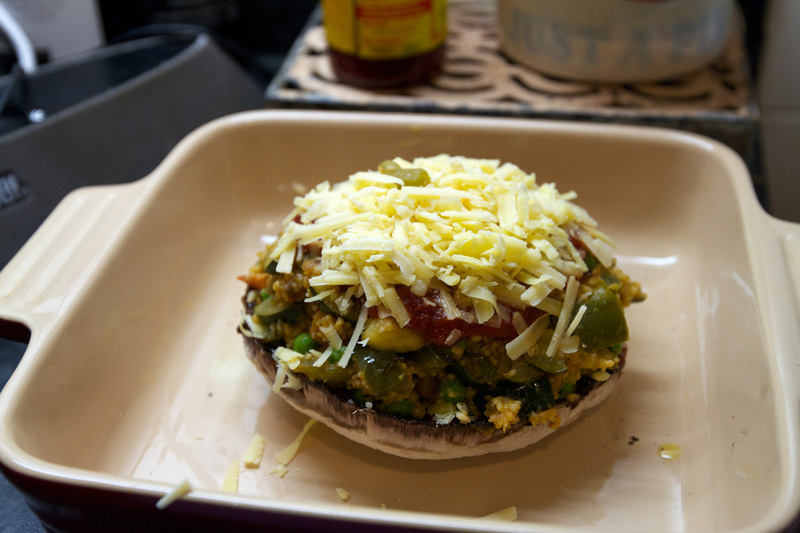 From here we will add it to the mushroom with some cheese, some of the tomato sauce and then pop in the oven. The first time I did it I made this monster mushroom. It looked great going in the oven but I put far too much on and it ended up like this…..
haha. It totally fell apart! Tasted great but didn’t look so good. 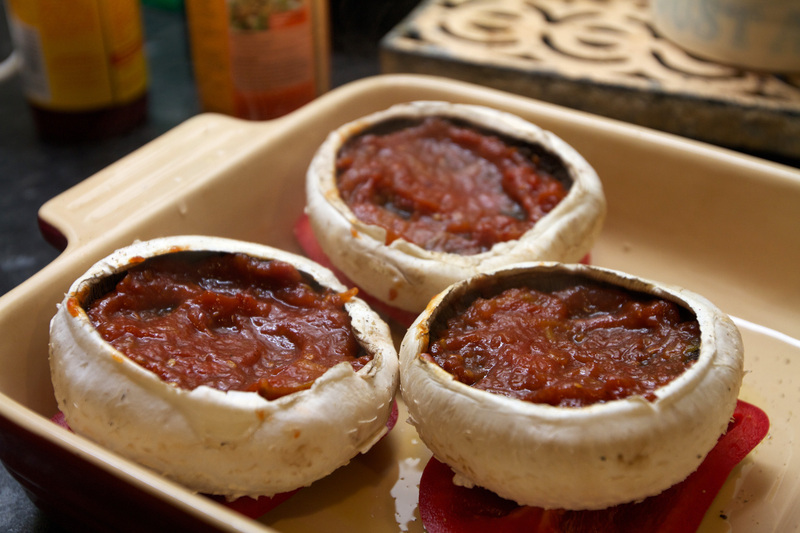 So the next day I got some slightly deeper large field mushrooms and spooned less of the mixture in them. It held together much better. I think it also worked better because the mixture was cold when I spooned it in. 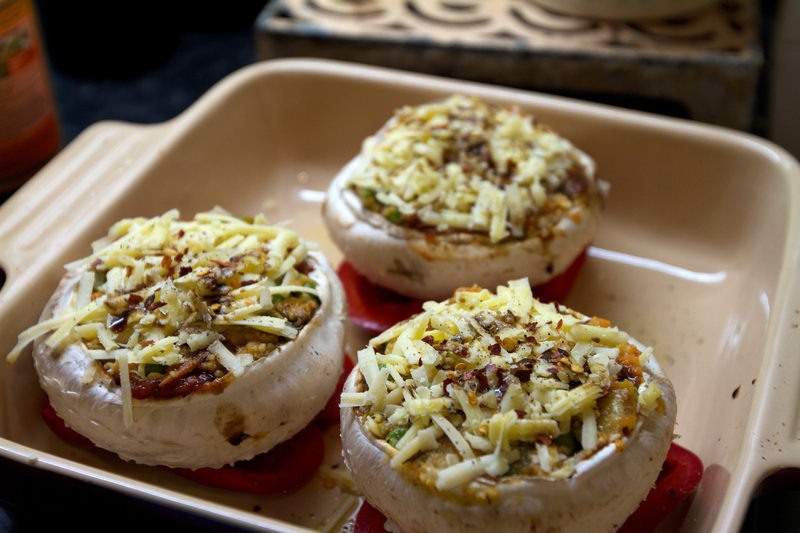 This would be a great thing to cook for a dinner party as you could do the hard bit the day before, then stuff the mushrooms the next day which takes 5 mins. Ok so the stages are. 1. 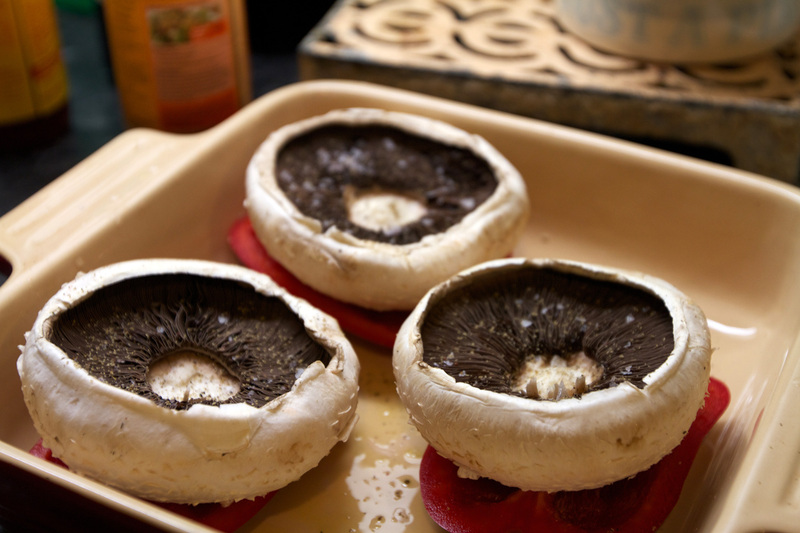 Add sliced some red peppers on the base putting each slice under each mushroom then build them up from there. Then season the mushroom with salt and pepper. 2. Spoon over a bit of the tomato mixture. 3. 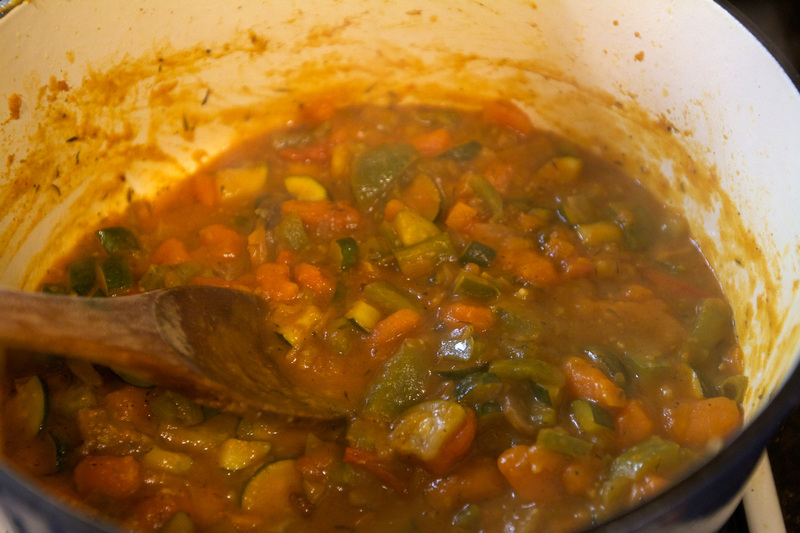 Then spoon in the main vege mixture and compact it in a bit. 4. Then a bit mre tomato sauce spread on top then sprinkle with cheese then season with salt, pepper and a bit of dried chilli if you like. I also added a splash of Worcestershire sauce. Pop in the oven and cook for about 30 mins For the first 15 mins cover with foil then remove foil for last 10-15mins. Temperature about 170°C I guess. I’ve said it before, my oven has a mind of it’s own so I just have to guess the temperature. It’s either high or low for me. Turned out ok tho! I served them with some sweet potato and carrot mash with a bit of extra tomato sauce. It would go great with some roast chicken or a nice steak if you want to keep the meat eaters happy. For the veggies out there serve with a nice salad and some sweet potato wedges. Use this recipe for wedges, just replace the normal potato with sweet potato. 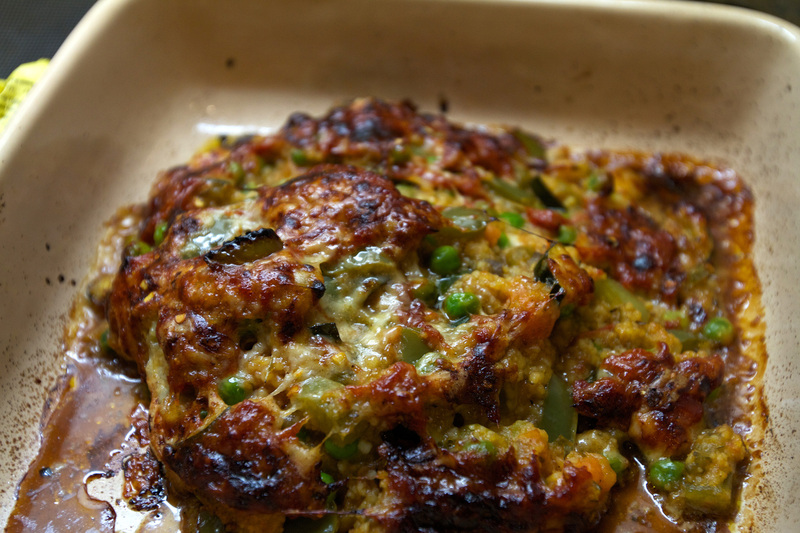 Tip: I think they’d work pretty well with something crunchy on top like some breadcrumbs mixed in with the cheese. I’ll try it next time and let you know.